It's easy to get about via taxis in Auckland. Although there is no public taxi company in Auckland, there are several private operators, and you'll see them driving about 24/7. Drivers are courteous and response times quick. Auckland Taxis are easy to get a hold of. There are several private companies operating within the city, all denoted by the different colours of 'light' on the top of the vehicles. 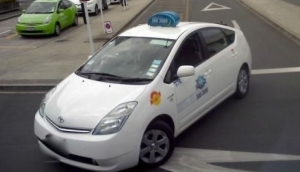 The majority of taxis are white with blue lights on top, but anything that looks like a cab, usually is. You can flag down cabs anywhere in the city, although at busy times it's advisable to pre-book. Response times are good, usually within 10 minutes, so make a note of some numbers and keep them with you. At the airport, you can get dropped off by any company, but only certain companies have licenses to pick up from the terminal. Join the queue, or pre-book - there are phones in the terminal building. As a general rule, try and agree a price with the driver, or at least an estimation, before you start your journey. Taxis in Auckland aren't as expensive as you might think, but they're still going to be more than a bus ride or a walk!